Do you remember around the time Iron Man 3 opened when there was a rush on Aldrich Killian toys? Oh yeah, that's right - it never happened! But someone at Marvel believed that the character, played by Guy Pearce, would be an easier sell toy-wise than if he were female. How do we know this? Iron Man 3 co-writer and director Shane Black spilled the beans during a recent interview with Uproxx, revealing that originally Killian was going to be played by a woman. Not only that, all of the women in the movie were initially given much bigger roles. “Stéphanie Szostak’s character [Ellen Brandt] was bigger at one point and we reduced it. 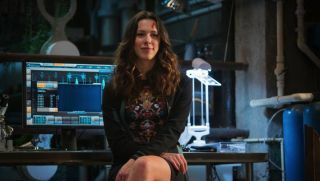 Rebecca Hall’s character [Maya Hansen] was bigger at one point and we reduced it… All I’ll say is this, on the record: There was an early draft of Iron Man 3 where we had an inkling of a problem. Which is that we had a female character who was the villain in the draft. We had finished the script and we were given a no-holds-barred memo saying that cannot stand and we’ve changed our minds because, after consulting, we’ve decided that toy won’t sell as well if it’s a female." The idea that a female baddie action figure wouldn't rake in as much cash is frankly, ludicrous. But, this line of thinking is believed to come from former Marvel Studios head Ike Perlmutter, who later handed over that title to Kevin Feige so he could focus solely on Marvel's TV output. Black adds that it had nothing to do with Feige. "And I don’t know if it was Ike, I don’t know who it was. They never told me who made the decision, we just got that memo one day and it was about toy sales." It's a sad state of affairs that we weren't given a fully-rounded female villain, as opposed to evil women who just played henchmen to Pearce's Killian. Not to mention the fact that the creative team, who dreamt up the movie, were denied the chance to make the film they wanted to make because of outdated mentalities. This isn't the first time it's happened either. Controversy surrounding Marvel's decision to keep Black Widow out of Avengers merchandise is also well-documented, which is interesting because she just topped a fan poll for the Avenger most people want to see in a solo movie. However, things are looking up. Since the change in Marvel's leadership, Avengers toys have started to finally include Black Widow (she's present in most of the Civil War toy sets) and we're now hearing more about that long-awaited spin-off for the character. About time, too. Especially now that Warner Bros. is developing an all-female villain movie.